Don Fanucci is a fictional character appearing in the Mario Puzo's novel The Godfather and the film The Godfather Part II, a sequel to the film version of Puzo's novel. Fanucci is portrayed by Gastone Moschin and is based on the personality of Ignazio Lupo, a real-life mafioso. 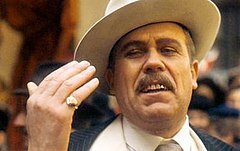 Fanucci is a Black Hand extortionist in Little Italy. Fanucci demands protection money from neighborhood businesses. Vito Corleone (Robert De Niro) witnesses Fanucci threatening to disfigure a young girl when her father refuses to pay him, and almost intervenes but is stopped by his friend, Genco Abbandando, who tells him who Fanucci really is. Vito also loses his job when Fanucci demands that Genco's father provide employment for his nephew, Keir. In the novel and in the chronological film version re-edited for TV (The Godfather Saga), Vito witnesses an attack on Fanucci by two youths of the neighborhood who are tired of Fanucci's oppression over the neighborhood. Although Fanucci screams for help, nobody comes to his rescue and the attack ends only when the youths have robbed him, cut his throat, and run away. Vito knows from his own experiences that a real Don would probably be escorted by bodyguards, and that anybody who dared attack him would be dealt with severely and publicly. Vito begins to suspect that Fanucci's power comes from the threat of force rather than force itself. One day, while Vito is driving a load of stolen merchandise, Fanucci jumps onto the moving vehicle. He explains that he has gotten word that Vito, Peter Clemenza (Bruno Kirby) and Sal Tessio (John Aprea) have participated in several robberies and are fencing the stolen goods. He demands $200 from the three men, but almost immediately states he will take slightly less if he is wrong on the amount. He also threatens to go to the police unless Vito gives him a cut of their profits. This confirms Vito's suspicions in the novel that Fanucci is not as powerful as he claims, as he would not have to anonymously get the police involved against Vito if he truly had the power and resources to retaliate. Vito assures Fanucci that he will convince his friends to pay him. That night, Vito meets with Clemenza and Tessio and expresses hesitations about paying Fanucci. They both tell Vito that they must pay, and when Vito mentions two bookies across town who he says don't pay Fanucci anything, Tessio and Clemenza insist that someone else must collect from them for Fanucci's boss, the Black Hand leader Maranzalla, from whom they fear retaliation rather than Fanucci. Vito meets with Fanucci, but offers only $100. Impressed with the young man's courage, he tells Vito he will find him work for good money. After the meeting, Vito follows Fanucci through the Feast of Saint Rocco and then, via the rooftops, to his apartment down the street. Letting himself in through a rooftop doorway, he descends to Fanucci's apartment and prepares to execute him. When Fanucci arrives, Vito shoots him dead, the sounds of gunfire masked by the carnival outside and by Vito using a rolled-up towel as a makeshift silencer. After the hit, Vito retrieves the money that Fanucci had taken earlier and then destroys the gun. Because the hit was carried out on Vito's own initiative and because he was the only one of the three not cowed by Fanucci, Vito moves from being equal partners with Tessio and Clemenza to being their uncontested boss in the operation. Vito, with Clemenza and Tessio as his lieutenants and Genco Abbandando as consigliere gradually take over the neighborhood and open a front operation, Genco Olive Oil Company, named after his dear friend and future consigliere. Because he treats the residents with a great deal more respect than Fanucci had, he soon earns the neighborhood's loyalty. Since Fanucci was not well-liked by the police, his murder is not fully investigated and assumed to be an assassination by a rival. Owing to his clean record, Vito is never suspected, though the open secret that he is responsible for Fanucci's death increases his reputation for toughness when it is needed. Unknown to Vito, his young son Sonny saw his father on the rooftop of Fanucci's apartment. However, this is not mentioned in the movie; it is mentioned in the book when Sonny is nearly caught by the police for armed robbery when he is 16. When Vito asks him why he stole, Sonny tells his father that he witnessed him disposing of the gun and fleeing the scene. It is this revelation that results in Sonny becoming a member of the Corleone crime family. Fanucci is based on Ignazio Lupo, a Black Hand boss and "made man" of the Morello crime family. According to some observers Fanucci seems to be based on Giosuè Gallucci, "the mobster who strolled in East Harlem in expensively tailored suits extorting protection money from everyone in New York’s Italian quarter." ^ "Fact and Fiction in The Godfather". crimelibrary.com. Archived from the original on 2014-04-03. Retrieved 2014-06-24. ^ "Fact and Fiction in The Godfather". truTV.com.